Mercedes have an optional integrated garage door opener system available for most models. It is integrated in the rear view mirror and can be seen by the fact it has 3 buttons on the bottom of the mirror (most models except SLK and the W163 (last generation) ML. The integrated garage door opener is made by Homelink. It is a relatively cheap factory fit option compared to the price of replacing the mirror with one with the integrated opener - mainly because you have to buy a whole new mirror and the mirrors with the dimming glass and with memory are expensive to start with. UK RRP for a mirror with integrated remote control is about £700. Factory fit price is under £200. The integrated garage door opener is made by HomeLink (part of Johnson Controls Inc) - Homelink also put the same mechanisms into most cars - so this information applies to most cars. Much of the information in this document is not in the Mercedes WIS database and thus it took a fair amount of digging to get the info. The same is true of the BMW as we had the same issues making the integrated Homelink garage door opener in a new BMW. There are two types of system, the North American system, and the rest-of-the world system. The Mercedes option codes are 232 (North America) and 231 (Rest of the world). This document only applis to the option code 231 system, although may have some relevance with the North American system. The mirrors have region codes. When a new mirror is supplied it is always set to 'Europe' (code 1) - but that is no good for UK and other markets. If you hold down the button 2 using the same process as for finding the software release above, 1 flash = Europe, 2 flash = France, 3 flash = UK, 4 flash = Italy. - Mercedes and BMW seem to have no information about this in their service databases, but if set wronly many garage door openers (for instance those using 418MHz transmitters like many FAAC systems) will not work. Homelink's customer service is excellent, you can phone or email them (contact details on website above), and they will supply you with compatability lists for older versions of the software. You can reset all learned remote controls by holding down buttons 1 and 3 until the lamp starts flashing after about 20 seconds. This should be done if you get a new mirror or used car with the mirror in. To assign a remote control to the button, hold down the mirror button and wait until the lamp starts flashing (if its already assigned to a remote this will take about 20 seconds, else about 2) - the whilst keeping the button held press the garage door opener button until the lamp starts flashing fast. If this doesnt work, check the region code of your system and check it is right for your country. The procedure for synchronising with 'rolling code' gate systems is more complicated and can be found in the owner's manual for your car. Press and hold buttons 1 and 3 again, and then after 1.5 to 2 seconds press the 2nd button briefly, it will flash to tell you the region code, press the 2nd button again to change to region 2 (and it will flash twice), again once for region 3 etc. Region 1 is Europe, Region 2 is France, Region 3 is UK, Region 4 is Italy. Auto-dimming - auto-dimming automatically dims the mirror when light shines in at night - if buying a new/replacement mirror, even if your car does not have this option you should get a mirror with this facility. If you look at the mirror you can see a little circle in the top right of the mirror glass - that is the sensor - you can see this in the picture at the bottom of this article. 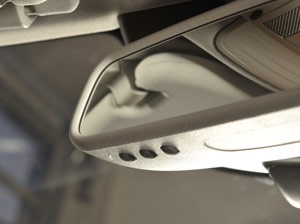 Multiple microphones: Microphones on newer cars (those from about mid 2004 when DVD based COMAND systems where introduced, and all the W211 E/CLS class cars) are built into the bottom of the mirror - there are 2 or 4 depending on the car there. Colour - watch the colour, there are 2 blacks for instance (black, and anthracite - so cars with anthracite alcantara roof linings get the anthracite coloured mirror. 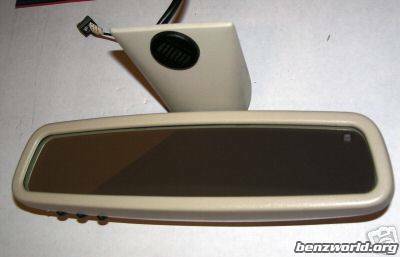 Picture of mirror with auto-dimming, single microphone and integrated garage door opener (courtesy of www.benzworld.org ).